Here are ten AWESOME art projects to do. You should do them so you can express your mind with your art. 1. If you have pets……try to draw them, If not……draw your dream pet. 2. When you feel bored, just try to do abstract art using random shapes and colors. 3. Draw your favorite things in your favorite color! Things look cool when you use different colors for them. I have done it before and it looked great. 5. If you are an animal lover…………… draw your favorite animal. 6. Try to make a birdhouse out of Popsicle sticks, to feed the beautiful birds that fly in the sky. 7. Make a fish out of a paper plate. Just cut a triangle and glue it on the back. 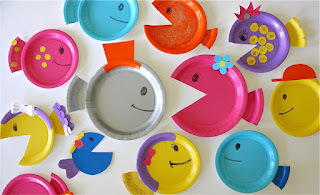 Make a whole school of fish if you have enough plates! 8. Draw whatever you are thinking. 9. Draw your mom or dad, or both! 10. Ask your parents to put paint on your hands and put it on paper. Please put your art projects in the comments, we would love to see it! Kidoz.com is a blog written by kids for kids! Kidoz.com is not associated with Kido'z, kidoz.net, kidoz.com.au, kidoz.in, Kiddoz! academia, or Kiddoz Inc. Things we like: animals, books, cool stuff, funny jokes, neat pictures, video games, and movies.